Not to be confused with Names of Japan. Yamada Tarō (山田太郎), a Japanese placeholder name (male), equivalent to John Smith in English. The equivalent of Jane Smith would be Yamada Hanako (山田花子). Japanese family names are extremely varied: according to estimates, there are over 100,000 different surnames in use today in Japan. The three most common family names in Japan are Satō (佐藤), Suzuki (鈴木), and Takahashi (高橋). This diversity is in stark contrast to the situation in other nations of the East Asian cultural sphere, which reflects a different history: while Chinese surnames have been in use for millennia and were often reflective of an entire clan or adopted from nobles (with or without any genetic relationship) and were thence transferred to Korea and Vietnam via noble names, the vast majority of modern Japanese family names date only to the 19th century, following the Meiji restoration, and were chosen at will. The recent introduction of surnames has two additional effects: Japanese names became widespread when the country had a very large population (over 30 million during the early Meiji era – see Demographics of Imperial Japan) instead of dating to ancient times (estimated population at 1 CE is 300,000, for instance – see Demographics of Japan before Meiji Restoration), and since little time has passed, Japanese names have not experienced as significant a surname extinction as has occurred in the much longer history in China. Surnames occur with varying frequency in different regions; for example, the names Chinen (知念), Higa (比嘉), and Shimabukuro (島袋) are common in Okinawa but not in other parts of Japan; this is mainly due to differences between the language and culture of Yamato people and Okinawans. Many Japanese family names derive from features of the rural landscape; for example, Ishikawa (石川) means "river of the stones", Yamamoto (山本) means "the base of the mountain", and Inoue (井上) means "above the well". While family names follow relatively consistent rules, given names are much more diverse in pronunciation and character usage. While many common names can easily be spelled or pronounced, many parents choose names with unusual characters or pronunciations, and such names cannot in general be spelled or pronounced unless both the spelling and pronunciation are given. Unusual pronunciations have especially become common, with this trend having increased significantly since the 1990s. For example, the popular masculine name 大翔 is traditionally pronounced "Hiroto", but in recent years alternative pronunciations "Haruto", "Yamato", "Taiga", "Sora", "Taito", "Daito", and "Masato" have all entered use. Male names often end in -rō (郎 "son", but also 朗 "clear, bright"; e.g. "Ichirō") -ta (太 "great, thick"; e.g. "Kenta") or -o (男 / 雄 / 夫 "man"; e.g. "Teruo" or "Akio"), or contain ichi (一 "first [son]"; e.g. "Ken'ichi"), kazu (also written with 一 "first [son]", along with several other possible characters; e.g. "Kazuhiro"), ji (二 "second [son]" or 次 "next"; e.g. "Jirō"), or dai (大 "great, large"; e.g. "Daichi"). The majority of Japanese people have one surname and one given name with no other names, except for the Japanese imperial family, whose members bear no surname. The family name – myōji (苗字 or 名字), uji (氏) or sei (姓) – precedes the given name, called the "name" – (名 mei) or "lower name" (下の名前 shita no namae). The given name may be referred to as the "lower name" because, in vertically written Japanese, the given name appears under the family name. People with mixed Japanese and foreign parentage may have middle names. Historically, myōji, uji and sei had different meanings. Sei was originally the patrilineal surname which is why up until now it has only been granted by the emperor as a title of male rank. The lower form of the name sei being tei which is a common name in Japanese men, although there was a male ancestor in ancient Japan from whom the name 'Sei' originally came. There were relatively few sei, and most of the medieval noble clans trace their lineage either directly to these sei or to the courtiers of these sei. Uji was another name used to designate patrilineal descent, but later merged with myōji around the same time. Myōji was, simply, what a family chooses to call itself, as opposed to the sei granted by the emperor. While it was passed on patrilineally in male ancestors including in male ancestors called haku (uncles), one had a certain degree of freedom in changing one's myōji. See also Kabane. Multiple Japanese characters have the same pronunciations, so several Japanese names have multiple meanings. A particular kanji itself can have multiple meanings and pronunciations. In some names, Japanese characters phonetically "spell" a name and have no intended meaning behind them. Many Japanese personal names use puns. Very few names can serve either as surnames or as given names (for example Mayumi 真弓, Kaneko 金子, Masuko 益子, or Arata 新). Therefore, to those familiar with Japanese names, which name is the surname and which is the given name is usually apparent, no matter which order the names are presented in. This thus makes it unlikely that the two names will be confused, for example, when writing in English while using the family name-given name naming order. However, due to the variety of pronunciations and differences in languages, some common surnames and given names may coincide when Romanized: e.g., Shoji (昌司, 昭次, or 正二) (given name) and Shoji (庄司, 庄子, 東海林, or 小路) (surname). Although usually written in Kanji, Japanese names have distinct differences from Chinese names through the selection of characters in a name and pronunciation. A Japanese person can distinguish a Japanese name from a Chinese name by looking at it. Akie Tomozawa, author of "Japan's Hidden Bilinguals: The Languages of 'War Orphans' and Their Families After Repatriation From China," said that this was equivalent to how "Europeans can easily tell that the name 'Smith' is English and 'Schmidt' is German or 'Victor' is English or French and 'Vittorio' is Italian". Japanese names are usually written in kanji (Chinese characters), although some names use hiragana or even katakana, or a mixture of kanji and kana. While most "traditional" names use kun'yomi (native Japanese) kanji readings, a large number of given names and surnames use on'yomi (Chinese-based) kanji readings as well. Many others use readings which are only used in names (nanori), such as the female name Nozomi (希). The majority of surnames comprise one, two or three kanji characters. There are also a small number of four or five kanji surnames, such as Teshigawara (勅使河原), Kutaragi (久多良木) and Kadenokōji (勘解由小路), but these are extremely rare. The sound no, indicating possession (like the apostrophe in English), and corresponding to the character の, is often included in names but not written as a separate character, as in the common name 井上 (i-no-ue, well-(possessive)-top/above, top of the well), or historical figures such as Sen no Rikyū. Most personal names use one, two, or three kanji. Four syllable given names are common, especially in eldest sons. As mentioned above, female given names often end in the syllable ko, written with the kanji meaning "child" (子), or mi, written with the kanji meaning "beautiful" (美). The usage of -ko (子) has changed significantly over the years: prior to the Meiji Restoration (1868), it was reserved for members of the imperial family. Following the restoration, it became popular and was overwhelmingly common in the Taishō and early Shōwa era. The suffix -ko increased in popularity after the mid-20th century. Around the year 2006, due to the citizenry mimicking naming habits of popular entertainers, the suffix -ko was declining in popularity. At the same time, names of western origin, written in kana, were becoming increasingly popular for naming of girls. By 2004 there was a trend of using hiragana instead of kanji in naming girls. Molly Hakes, author of The Everything Conversational Japanese Book: Basic Instruction For Speaking This Fascinating Language In Any Setting, said that this may have to do with using hiragana out of cultural pride, since hiragana is Japan's indigenous writing form, or out of not assigning a meaning to a girl's name so that others do not have a particular expectation of her. Names ending with -ko dropped significantly in popularity in the mid 1980s, but are still given, though much less than in the past. Male names occasionally end with the syllable ko as in Mako, but very rarely using the kanji 子 (most often, if a male name ends in -ko, it ends in -hiko, using the kanji 彦 meaning "boy"). Common male name endings are -shi and -o; names ending with -shi are often adjectives, e.g., Atsushi which might mean, for example, "(to be) faithful." In the past (before World War II), names written with katakana were common for women, but this trend seems to have lost favour. Hiragana names for women are not unusual. Kana names for boys, particularly those written in hiragana, have historically been very rare. This may be in part because the hiragana script is seen as feminine; in medieval Japan, women generally were not taught kanji and wrote exclusively in hiragana. Names cannot begin with the syllable n (ん, ン); this is in common with other proper Japanese words, though colloquial words may begin with ん, as in んまい (nmai, variant of うまい umai, delicious). Some names end in n: the male names Ken, Shin, and Jun are examples. The syllable n should not be confused with the consonant n, which names can begin with; for example, the female name Naoko (尚子) or the male Naoya (直哉). (The consonant n needs to be paired with a vowel to form a syllable). One large category of family names can be categorized as "-tō" names. The kanji 藤, meaning wisteria, has the on'yomi tō (or, with rendaku, dō). Many Japanese people have surnames that include this kanji as the second character. This is because the Fujiwara clan (藤原家) gave their samurai surnames (myōji) ending with the first character of their name, to denote their status in an era when commoners were not allowed surnames. Examples include Atō, Andō, Itō (although a different final kanji is also common), Udō, Etō, Endō, Gotō, Jitō, Katō, Kitō, Kudō, Kondō, Saitō, Satō, Shindō, Sudō, Naitō, Bitō, and Mutō. As already noted, some of the most common family names are in this list. Japanese family names usually include characters referring to places and geographic features. A name written in kanji may have more than one common pronunciation, only one of which is correct for a given individual. For example, the surname written in kanji as 東海林 may be read either Tōkairin or Shōji. Conversely, any one name may have several possible written forms, and again, only one will be correct for a given individual. The character "一" when used as a male given name may be used as the written form for "Hajime," "Hitoshi," "Ichi- / -ichi" "Kazu- / -kazu," and many others. The name "Hajime" may be written with any of the following: 始, 治, 初, 一, 元, 肇, 創, 甫, 基, 哉, 啓, 本, 源, 東, 大, 孟, or 祝. This many-to-many correspondence between names and the ways they are written is much more common with male given names than with surnames or female given names, but can be observed in all these categories. The permutations of potential characters and sounds can become enormous, as some very overloaded sounds may be produced by over 500 distinct Kanji and some Kanji characters can stand for several dozen sounds. This can and does make the collation, pronunciation, and romanization of a Japanese name a very difficult problem. For this reason, business cards often include the pronunciation of the name as furigana, and forms and documents often include spaces to write the reading of the name in kana (usually katakana). A few Japanese names, particularly family names, include archaic versions of characters. For example, the very common character shima, island, may be written as 嶋 or 嶌 instead of the usual 島. Some names also feature very uncommon kanji, or even kanji which no longer exist in modern Japanese. Japanese people who have such names are likely to compromise by substituting similar or simplified characters. This may be difficult for input of kanji in computers, as many kanji databases on computers only include common and regularly used kanji, and many archaic or mostly unused characters are not included. An odd problem occurs when an elderly person forgets how to write their name in old Kanji that is no longer used. An example of such a name is Saitō. There are two common kanji for sai here. The two sai characters have different meanings: 斉 means "together" or "parallel", but 斎 means "to purify". These names can also exist written in archaic forms, as 齊藤 and 齋藤 respectively. Family names are sometimes written with periphrastic readings, called jukujikun, in which the written characters relate indirectly to the name as spoken. For example, 四月一日 would normally be read as shigatsu tsuitachi ("April 1st"), but as a family name it is read watanuki ("unpadded clothes"), because April 1 is the traditional date to switch from winter to summer clothes. In the same way 小鳥遊 would normally be read as kotori asobi ("little birds play") or shōchōyū, but is read Takanashi, because little birds (kotori) play (asobi) where there are no (nashi) hawks (taka). Most Japanese people and agencies have adopted customs to deal with these issues. Address books, for instance, often contain furigana or ruby characters to clarify the pronunciation of the name. Japanese nationals are also required to give a romanized name for their passport. The recent use of katakana in Japanese media when referring to Japanese celebrities who have gained international fame has started a fad among young socialites who attempt to invoke a cosmopolitan flair using katakana names as a badge of honor. All of these complications are also found in Japanese place names. Not all names are complicated. Some common names are summarized by the phrase tanakamura ("the village in the middle of the rice fields"): the three kanji: 田 (ta, rice field), 中 (naka, middle) and 村 (mura, village), together in any pair, form a simple, reasonably common surname: Tanaka, Nakamura, Murata, Nakata (Nakada), Muranaka, Tamura. Despite these difficulties, there are enough patterns and recurring names that most native Japanese will be able to read virtually all family names they encounter and the majority of personal names. Some common interesting names with phonetic puns include Michio Kaku, which could mean "Draw a path" or "Lead the way", and Tsutomu Hata, which can mean "Work for the flag (nation)", but the Kanji used to write them obscure these meanings. Kanji names in Japan are governed by the Japanese Ministry of Justice's rules on kanji use in names. As of January 2015[update], only the 843 "name kanji" (jinmeiyō kanji) and 2,136 "commonly used characters" (jōyō kanji) are permitted for use in personal names. This is intended to ensure that names can be readily written and read by those literate in Japanese. Rules also govern names considered to be inappropriate; for example, in 1993 two parents who tried to name their child Akuma (悪魔, which literally means "devil") were prohibited from doing so after a massive public outcry. Though there are regulations on the naming of children, many archaic characters can still be found in adults' names, particularly those born prior to the Second World War. Because the legal restrictions on use of such kanji cause inconvenience for those with such names and promote a proliferation of identical names, many recent changes have been made to increase rather than to reduce the number of kanji allowed for use in names. The Sapporo High Court held that it was unlawful for the government to deny registration of a child's name because it contained a kanji character that was relatively common but not included in the official list of name characters compiled by the Ministry of Justice. Subsequently, the Japanese government promulgated plans to increase the number of kanji "permitted" in names. The use of a space in given names (to separate first and middle names) is not allowed in official documents, because technically, a space is not an allowed character. However, spaces are sometimes used on business cards and in correspondence. In ancient times, people in Japan were considered the property of the Emperor and their surname reflected the role in the government they served. An example is Ōtomo (大友 'great attendant, companion'). Names would also be given in the recognition of a great achievement and contribution. Until the Meiji Restoration, Japanese common people (people other than kuge and samurai) had no surnames, and when necessary, used a substitute such as the name of their birthplace. For example, Ichirō born in Asahi-mura (Asahi village) in the province of Musashi would say "Ichirō from Asahi-mura of Musashi". Merchants were named after their stores or brands (for example, Denbei, the owner of Sagamiya, would be Sagamiya Denbei), and farmers were named after their fathers (for example, Isuke, whose father was Genbei, would be "Isuke, son of Genbei"). After the Meiji Restoration, the government ordered all commoners to assume surnames in addition to their given names, as part of modernization and Westernization; this was specified in the Family Register Law of 1898. Many people adopted historical names, others simply made names up, chose names through divination, or had a Shinto or Buddhist priest choose a surname for them. This explains, in part, the large number of surnames in Japan, as well as their great diversity of spelling and pronunciation, and makes tracing ancestry past a certain point extremely difficult in Japan. During the period when typical parents had several children, it was a common practice to name sons by numbers suffixed with rō (郎, "son"). The first son would be known as "Ichirō", the second as "Jirō", and so on. Girls were often named with ko (子, "child") at the end of the given name; this should not be confused with the less common male suffix hiko (彦). Both practices have become less common, although many children still have names along these lines. While some people may still believe this, Lafcadio Hearn (see below), in Shadowings, makes it clear that at least in his time (1880 to 1905, the date of publication), the ending -ko (子) was not any part of the name, but an honorific suffix like さん -san. Particularly, even though the symbol was "child", it meant "Lady" and was used only by upper-class females. It would have been ridiculous to apply to middle-class or lower-class women. Pretty much the same names were used by all classes, but Hana-ko was upper class, while lesser women would be O-Hana-san, with honorific prefix as well as suffix. The way in which a name is used in conversation depends on the circumstances and the speaker's relationships with the listener and the bearer of the name. Typically the family name is used, with given names largely restricted to informal situations and cases where the speaker is older than, superior to, or very familiar with the named individual. When addressing someone, or referring to a member of one's out-group, a title such as さん -san is typically added. Japanese people often avoid referring to their seniors or superiors by name at all, using just a title: within a family this might be a kinship relation such as お母さん okāsan ("mother"), in a school it could be 先生 sensei ("teacher"), while a company president would be addressed as 社長 shachō ("company president"). On the other hand, pronominals meaning "you" ( あなた anata, きみ kimi, お前 omae ) are used rather little in Japanese. Using such words sometimes sounds disrespectful, and people will commonly address each other by name, title and honorific even in face-to-face conversations. Calling someone's name (family name) without any title or honorific is called yobisute (呼び捨て), and may be considered rude even in the most informal and friendly occasions. This faux pas, however, is readily excused for foreigners. Corresponding to any given name there are one or more hypocoristics, affectionate nicknames. These are formed by adding the suffix -chan ちゃん to a stem. There are two types of stem. One consists of the full given name. Examples of this type are Tarō-chan from Tarō, Kimiko-chan from Kimiko, and Yasunari-chan from Yasunari. The other type of stem is a modified stem derived from the full given name. Examples of such names are: Ta-chan from Tarō, Kii-chan from Kimiko, and Yā-chan from Yasunari. Hypocoristics with modified stems are more intimate than those based on the full given name. Hypocoristics with modified stems are derived by adding -chan to a stem consisting of an integral number, usually one but occasionally two, of feet, where a foot consists of two moras. A mora 音節 is the unit of which a light syllable contains one and a heavy syllable two. For example, the stems that may be derived from Tarō are /taro/, consisting of two light syllables, and /taa/, consisting of a single syllable with a long vowel, resulting in Taro-chan and Tā-chan. The stems that may be derived from Hanako are /hana/, with two light syllables, /han/, with one syllable closed by a consonant, and /haa/, with one syllable with a long vowel, resulting in Hanachan, Hanchan, and Hāchan. The segmental content is usually a left substring of that of the given name. However, in some cases it is obtained by other means, including the use of another reading of the kanji used to write the name. For example, a girl named Megumi may be called Keichan or just Kei, because the character used to write the Megumi, 恵, can also be read Kei. The common Japanese practice of forming abbreviations by concatenating the first two morae of two words is sometimes applied to names (usually those of celebrities). For example, Takuya Kimura (木村 拓哉, Kimura Takuya), a famous Japanese actor and singer, becomes Kimutaku (キムタク). This is sometimes applied even to non-Japanese celebrities: Brad Pitt, whose full name in Japanese is Buraddo Pitto (ブラッド・ピット) is commonly known as Burapi (ブラピ), and Jimi Hendrix is abbreviated as Jimihen (ジミヘン). Some Japanese celebrities have also taken names combining kanji and katakana, such as Terry Ito (テリー伊藤). Another slightly less common method is doubling one or two syllables of the person's name, such as the use of "MamiMami" for Mamiko Noto. Many ethnic minorities, mostly Korean and Chinese, living in Japan adopt Japanese names. The roots of this custom go back to the colonial-era policy of sōshi-kaimei, which permitted many Koreans to change their names to Japanese names. Nowadays, ethnic minorities, mostly Korean, who immigrated to Japan after the WWII, take on Japanese names, sometimes called pass names, to ease communication and, more importantly, to avoid discrimination. A few of them (e.g., Han Chang-Woo, founder and chairman of Maruhan Corp., pronounced Kan Shōyū in Japanese) still keep their native names. Sometimes, however, these ethnic Chinese and Koreans in Japan who choose to renounce Permanent Resident status to apply for Japanese citizenship have to change the characters in their names, because not all characters are legally recognized in Japan for naming purposes. Japanese citizenship used to require adoption of a Japanese name. In recent decades, the government has allowed individuals to simply adopt katakana versions of their native names when applying for citizenship, as is already done when referring to non-East Asian foreigners: National Diet member Tsurunen Marutei (ツルネン マルテイ), originally Martti Turunen, who is Finnish, is a famous example. Others transliterate their names into phonetically similar kanji compounds, such as activist Arudou Debito (有道 出人), an American previously known as David Aldwinckle (Tsurunen has similarly adopted 弦念 丸呈), although these renderings are artificial and would not exist in Japan otherwise. Still others have abandoned their native names entirely in favor of traditional Japanese names, such as Lafcadio Hearn (who was half Anglo-Irish and half Greek), who used the name "Koizumi Yakumo" (小泉 八雲). At the time, to gain Japanese citizenship, it was necessary to be adopted by a Japanese family (in Hearn's case, it was his wife's family) and take their name. Individuals born overseas with Western given names and Japanese surnames are usually given a katakana name in Western order when referred to in Japanese. Eric Shinseki, for instance, is referred to as エリック シンセキ (Erikku Shinseki). However, sometimes Japanese parents decide to use Japanese order when mentioning the child's name in Japanese. Also, Japanese parents tend to give their children a name in kanji, hiragana or katakana, particularly if it is a Japanese name. Even individuals born in Japan, with a Japanese name, might be referred to using katakana, if they've established residency or a career overseas. Yoko Ono, for example, was born in Japan, with the name 小野 洋子, and spent the first twenty years of her life there. However, having lived outside the country for more than fifty years, and basing her career in the United States, Ono is often referred to in the press as オノ・ヨーコ, preserving the Japanese order of her name (Ono Yōko), but rendering it in katakana. There is a restriction (as of 2001[update]) on the use of the "v" character in a name unless at least one of the parents is of foreign origin. The closest corresponding katakana is ヴ (vu), which can be romanized as v or b. This affects issuing of Japanese passports or other documentation where a romanization of the name is given; the letter v is replaced with b. This affects names such as Kevin (ケヴィン), which would be written as Kebin. Japan's Christians traditionally have Christian names in addition to their native Japanese names. These Christian names are written using katakana, and are adapted to Japanese phonology from their original Latin forms rather than being borrowed from any particular language like English. Peter, for example, is Petoro (ペトロ), John is Yohane (ヨハネ), Jacob is Yakobu (ヤコブ), Martin is Maruchino (マルチノ), Dominic is Dominiko (ドミニコ), and so on. For most purposes in real life, the Christian names aren't used; for example, Taro Aso has a Christian name, Francis (フランシスコ Furanshisuko), which is not nearly as well-known. The Japanese emperor and his families have no surname for historical reasons, only a given name such as Hirohito (裕仁), which is almost universally avoided in Japan: Japanese prefer to say "the Emperor" or "the Crown Prince", out of respect and as a measure of politeness. When children are born into the Imperial family, they receive a standard given name, as well as a special title. For instance, the current Emperor was born Tsugu-no-miya Akihito (継宮明仁), his title being Tsugu-no-miya (継宮 "Prince Tsugu"), and was referred to as "Prince Tsugu" during his childhood. This title is generally used until the individual becomes heir to the throne or inherits one of the historical princely family names (常陸宮 Hitachi-no-miya, 三笠宮 Mikasa-no-miya, 秋篠宮 Akishino-no-miya, etc.). When a member of the Imperial family becomes a noble or a commoner, the emperor gives him or her a family name. In medieval era, a family name "Minamoto" was often used. In modern era, princely family names are used. For example, many members of the extended Imperial family became commoners after World War II, and adopted their princely family names, minus the honorific "no-miya" (宮 "Prince"), as regular surnames. Conversely, at the time that a noble or a commoner become a member of the Imperial family, such as through marriage, his or her family name is lost. An example is Empress Michiko, whose name was Michiko Shōda before she married prince Akihito. The current structure (family name + given name) did not materialize until the 1870s when the government made the new family registration system. In feudal Japan, names reflected a person's social status, as well as their affiliation with Buddhist, Shintō, feudatory-military, Confucian-scholarly, mercantile, peasant, slave and imperial orders. Before feudal times, Japanese clan names figured prominently in history: names with no fall into this category. No means of and is similar in usage to the aristocratic von in German although the association is in the opposite order in Japanese, and is not generally explicitly written in this style of name. Thus, Minamoto no Yoritomo (源 頼朝) was Yoritomo (頼朝) of the Minamoto (源) clan. Fujiwara no Kamatari (藤原 鎌足), Ki no Tsurayuki (紀 貫之), and Taira no Kiyomori (平 清盛) are additional examples. These family names were recorded in Shinsen Shōjiroku. Ryukyuan ruling class used names composed of Chinese characters, usually of one or two syllables and read in their languages, like Korean and Chinese names. Before the government formalized the naming system in 1868, Japanese personal names were fluid. Men changed their names for a variety of reasons: to signify that they had attained a higher social status, to demonstrate their allegiance to a house or clan, to show that they had succeeded to the headship of a family or company, to shed bad luck that was attached to an inauspicious name, or simply to avoid being mistaken for a neighbor with a similar name. Upper-class men often changed their names upon coming of age (genpuku), leaving behind their childhood name (which often ended with -maru) and taking on an adult name. When nobles and samurai received promotions in rank, they received new names, which might contain a syllable or character from their lord's name as a mark of favor. Women's personal name changes were recorded less often, so they may not have changed their names as frequently as men did, but women who went into service as maids or entertainers frequently changed their names for the duration of their service. During their employment, their temporary names were treated as their legal names. For example, a maid who was involved in legal dealings in Kyoto in 1819-1831 signed legal documents as Sayo during one period of employment and as Mitsu during a later period of employment, but she signed as Iwa, presumably her birth name, when she was between jobs. A Japanese person could go by one of several names, depending on the occasion. For example, the famous 18th-century author, poet, and artist Iwase Samuru wrote under the name Santō Kyōden and worked as an illustrator under the name Kitao Masanobu. Artists and authors adopted a new name for each medium or form they worked in, whether or not they worked professionally. Some types of artistic names (gō [号]) were referred to by special terminology—for example, haigō or haimei for a haiku poet, and kagō for a Waka poet. Scholars also gave themselves a scholarly name, which was often the Chinese reading of the characters of their Japanese name. People who entered a religious order adopted a religious name. Death added to the number of a person's names. When a person died, their personal name was referred to as an imina (諱) and was no longer used. Instead, the person was referred to by their posthumous name (諡, okurina). The personal names of Japanese emperors were also referred to as imina, even if the emperor was alive. Prior to Emperor Jomei, the imina of the emperors were very long and not used. The number of characters in each name diminished after Jomei's reign. Azana (字), which is given at genpuku (元服), is used by others and one himself uses his real name to refer to him. 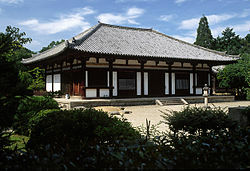 Gō are commonly named after places or houses; e.g., Basho, as in the Haiku poet Matsuo Bashō (松尾 芭蕉), is named after his house, Bashō-an (芭蕉庵). In the late shogunate period, many anti-government activists used several false names to hide their activities from the shogunate. Examples are Saidani Umetarō (才谷 梅太郎) for Sakamoto Ryōma (坂本 龍馬), Niibori Matsusuke (新堀 松輔) for Kido Takayoshi (木戸 孝允) and Tani Umenosuke (谷 梅之助) for Takasugi Shinsaku (高杉 晋作). The famous writer Kyokutei Bakin (曲亭 馬琴) is known to have had as many as 33 names. Actors and actresses in Western and Japanese dramatic forms, comedians, sumo wrestlers, Western-style professional wrestlers, and practitioners of traditional crafts often use professional names. Many stage names of television and film actors and actresses are unremarkable, being just like ordinary Japanese personal names, but a few are tongue-in-cheek. For example, Kamatari Fujiwara (藤原 釜足) chose the name of the aforementioned founder of the Fujiwara family, while Hino Yōjin (日野 陽仁)'s name sounds like be careful with fire (although written differently). Many stand-up comics like the duo Beat Takeshi and Beat Kiyoshi choose a Western name for the act, and use their own (or stage) given names. Writers also tend to be clever about their names, for example Edogawa Ranpo which is designed to sound like "Edgar Allan Poe". Sumo wrestlers take wrestling names called shikona (醜名 or 四股名). While a shikona can be the wrestler's own surname, most upper-division rikishi have a shikona different from their surname. A typical shikona consists of two or three kanji, rarely just one or more than three. Often, part of the name comes from the wrestler's master, a place name (such as the name of a province, a river, or a sea), the name of a weapon, an item identified with Japanese tradition (like a koto or nishiki), or a term indicating superiority. Often, waka indicates a wrestler whose father was also in sumo; in this case, the meaning is junior. Wrestlers can change their shikona, as Takahanada did when he became Takanohana (貴ノ花) and then Takanohana (貴乃花). Another notable example is the wrestler Sentoryu, which means fighting war dragon but is also homophonous with St. Louis, his city of origin. Geisha and practitioners of traditional crafts and arts such as pottery, the tea ceremony, calligraphy, irezumi (tattooing) and ikebana (flower arranging) often take professional names. In many cases, these come from the master under whom they studied. Kabuki actors take one of the traditional surnames such as Nakamura (中村), Bandō or Onoe. Some names are inherited on succession, such as that of the famous Kabuki actor Bandō Tamasaburō V (五代目 坂東 玉三郎 Godaime Bandō Tamasaburō) through a naming ceremony. In English, the names of living or recently deceased Japanese are generally given surname last and without macrons. Historical figures are given surname first and with macrons, if available. 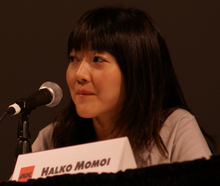 Haruko Momoi at the Anime Expo 2007 in Los Angeles; her name card features a spelling of her name ("Halko Momoi") written surname last. In Japanese, her name is 桃井はるこ (Momoi Haruko). As of 2008, when using English and other Western languages Japanese people usually give their names in an order reversed from the traditional Japanese naming order, with the family name after the given name, instead of the given name after the family name. Beginning in Meiji Era Japan, in many English-language publications the naming order of modern-day Japanese people is reversed into the family name last order. Japanese people adopted using western naming order in European languages as a part of the Meiji era adoption of aspects of western culture, as part of proving to the wider world that Japan was a developed country rather than an undeveloped country. When Japanese people attended events for the international community, such as balls, Japanese people used the western naming order. Japanese often have nicknames that are shortened forms of their actual names, and they use these names with foreigners. For instance "Kazuyuki" may call himself "Kaz." Some Japanese living abroad adopt nicknames that they use with friends who are non-Japanese; these names are not considered middle names. Here Fumiko Orikasa's name is presented family name first in Japanese while it is presented given name first in English. Most foreign publications reverse the names of modern individuals, and most Japanese reverse their own names when creating materials for foreign consumption. A Japanese executive or official usually has two business cards (meishi): one in Japanese and intended for fellow Japanese, using Japanese order, and another intended for foreigners, with the name in Western order. In popular journalism publications, western order is used. In English many historical figures are still referred to with the family name first. This is especially the case in scholarly works about Japan. Many scholarly works use Japanese order with Japanese names in general, and a scholarly work is more likely to use Japanese order if the author is a Japanologist. John Power, author of "Japanese names," wrote "People who can speak and read Japanese have a strong resistance to switching Japanese names to the Western order." Books written by these authors often have notes stating that Japanese names are in the original order. Some books do not have consistent naming order practices. Shizuka Saeki of Look Japan said, "This is not only a headache for writers and translators, it is also a source of confusion for readers." Lynne E. Riggs of the Society of Writers, Editors and Translators (SWET), a professional writing organization headquartered in Tokyo, said, "When you publish a book about Japan, you are publishing it for people who want to know about Japan. So they are interested in learning something new or something as it is supposed to be." Saeki said in 2001 that most Japanese people writing in English use western order, but that some figures began to promote the use of Japanese order as Japan became a major economic power in the 20th century. The Japan Style Sheet, a 1998 guide for producing English language works about Japan written by SWET, advocates the use of the Japanese naming order as often as possible because the translators wanted to promote a consistency in naming order. In 1987, one publisher of English language textbooks in Japan used Japanese order, while in 2001 six of the eight publishers of English language textbooks in Japan use Japanese order. In December 2000 the Council on the National Language of the Ministry of Education recommended that English language productions begin using the Japanese naming order because "it is in general desirable that personal names be presented and written in a way that preserves their unique forms, except for registries and other documents with specific standards." It recommended using capitalization (YAMADA Taro) or commas (Yamada, Taro) to clarify which part of the personal name is the family name and which part is the given name. In a January 2000 opinion poll from the Agency for Cultural Affairs on the preferred order of Japanese names in the English language, 34.9% had a preference for Japanese order, 30.6% had a preference for Western order, and 29.6% had no preference. In 1986 the Japan Foundation decided that it would use the Japanese naming order in all of its publications. A Japan Foundation publishing division spokesperson stated around 2001 that some SWET publications, including popular anglophone newspapers, continue to use western order. As of 2001 the agency's style sheet recommends using a different naming order style depending upon the context. For instance it advocates using the western order in publications for readers who are not familiar with Japan, such as international conference papers. The Chicago Manual of Style recommends indexing Japanese names according to the way the original text treats the name. If the text uses the Western order, the Japanese name is reinverted and indexed by the family name with a comma. If the text uses Japanese order, the name is listed by the family name with no inversion and no comma. In Chinese-speaking communities, Japanese names are pronounced according to the Chinese pronunciation of the characters. For example, in Mandarin, 山田 太郎 (Yamada Tarō) becomes Shāntián Tàiláng, while 鳩山 由紀夫 (Hatoyama Yukio) becomes Jiūshān Yóujìfū. As a result, a Japanese person without adequate knowledge of Chinese would not understand their name when it is spoken in Chinese. Simply porting the kanji into Chinese and reading them as if they were Chinese is also different from the usual Chinese practice of approximating foreign names with similar-sounding Chinese characters. Sometimes, a Japanese name includes kokuji. These kanji resemble Chinese characters but originate in Japan and do not have widely-known Chinese pronunciations. For example, the word komu (込, read as Yū in Chinese) is rarely used in modern Chinese reading. When words like this are encountered, usually the rule of "有邊讀邊，沒邊讀中間" ("read the side if any, read the middle part if there is no side") applies. Therefore, "込" is read as "rù" which is derived from 入.
Heng Ji, the author of "Improving Information Extraction and Translation Using Component Interactions," wrote that because Japanese names have "flexible" lengths, it may be difficult for someone to identify a Japanese name when reading a Chinese text. When consulting English texts a Chinese reader may have difficulty identifying a Japanese name; an example was when Chinese media mistook Obama's pet turkey Abe taken from Abe Lincoln (monosyllabic) for Shinzo Abe (disyllabic). One place where Japanese names may be translated into Chinese languages phonetically is in Japanese video games, anime and manga series. In May 2016, Nintendo sparked anger among fans in Hong Kong by announcing that its new Pokémon games, Sun and Moon, would be translated into Mandarin across all parts of China and Taiwan, meaning that names of well-known characters such as Pikachu would no longer have the correct pronunciation when read in places such as Hong Kong and other regions where Mandarin is not the main language spoken. ^ 山田太郎から進化を続ける「名前例」 ['Example Names' Continue to Evolve beyond Yamada Tarō]. Excite Bit (in Japanese). Excite News. 20 February 2012. Retrieved 6 December 2012. ^ "Japanese name translations". Japanese-name-translation.com. Archived from the original (XLS) on 2006-06-24. ). ^ a b c d "What to call baby?". The Japan Times Online. Retrieved 2012-01-24. ^ "How do Japanese names work?". www.sljfaq.org. Retrieved 2017-11-14. ^ a b c d e f Power, p. C4-2. ^ a b c Hanks, Patrick, Kate Hardcastle, and Flavia Hodges. A Dictionary of First Names. Oxford University Press, 2006. Appendix 8: Japanese Names. Retrieved from Google Books on April 1, 2012. ISBN 0-19-861060-2, ISBN 978-0-19-861060-1. ^ Tomozawa, Akie. Chapter 6: "Japan's Hidden Bilinguals: The Languages of 'War Orphans' and Their Families After Repatriation From China." In: Noguchi, Mary Goebel and Sandra Fotos (editors). Studies in Japanese Bilingualism. Multilingual Matters, 2001. 158-159. Retrieved from Google Books on October 25, 2012. ISBN 185359489X, 9781853594892. ^ a b Hakes, Molly. The Everything Conversational Japanese Book: Basic Instruction For Speaking This Fascinating Language In Any Setting. Everything Books, 2004. 121. Retrieved from Google Books on August 8, 2011. ISBN 1-59337-147-0, ISBN 978-1-59337-147-0. ^ Hakes, Molly. The Everything Conversational Japanese Book: Basic Instruction For Speaking This Fascinating Language In Any Setting. Everything Books, 2004. 120. Retrieved from Google Books on August 8, 2011. ISBN 1-59337-147-0, ISBN 978-1-59337-147-0. ^ 人名用漢字の新字旧字：「曽」と「曾」 (in Japanese). Sanseido Word-Wise Web. Retrieved 2014-10-09. ^ "Bishops of Japan (by Age)". www.gcatholic.org. Retrieved 14 April 2018. ^ Nagata, Mary Louise. "Names and Name Changing in Early Modern Kyoto, Japan." International Review of Social History 07/2002; 47(02):243 – 259. P. 246. ^ a b Plutschow, Herbert E. Japan's Name Culture: The Significance of Names in a Religious, Political and Social Context. Psychology Press, 1995. ^ Nagata 2002, pp. 245-256. ^ Ravina, Mark. The Last Samurai: The Life and Battles of Saigo Takamori. John Wiley and Sons, 2011. Names, Romanizations, and Spelling (page 1 of 2). Retrieved from Google Books on August 7, 2011. ISBN 1-118-04556-4, ISBN 978-1-118-04556-5. ^ Brown, Delmer M.; Ishida, Ichirō (1979). The Future and the Past (a translation and study of the Gukanshō, an interpretive history of Japan written in 1219). Berkeley: University of California Press. p. 264. ISBN 978-0-520-03460-0. OCLC 251325323. ^ See International Who's Who, which is recommended for this purpose by the Chicago Manual of Style. ^ See Merriam-Webster's Biographical Dictionary, Merriam-Webster's Collegiate Dictionary, and Encyclopædia Britannica. See also Chicago Manual of Style, "Personal names—additional resources" (§8.3): "For names of well-known deceased persons, Chicago generally prefers the spellings in Merriam-Webster's Biographical Dictionary or the biographical section of Merriam-Webster's Collegiate Dictionary." ^ a b "三．国際化に伴うその他の日本語の問題." Ministry of Education, Culture, Sports, Science and Technology. Retrieved on May 23, 2011. "日本人の姓名をローマ字で表記するときに，本来の形式を逆転して「名－姓」の順とする慣習は，明治の欧化主義の時代に定着したものであり，欧米の人名の形式に合わせたものである。現在でもこの慣習は広く行われており，国内の英字新聞や英語の教科書も，日本人名を「名－姓」順に表記しているものが多い。ただし，「姓－名」順を採用しているものも見られ，また，一般的には「名－姓」順とし，歴史上の人物や文学者などに限って「姓－名」順で表記している場合もある。"
^ a b c d e f Saeki, Shizuka. "First Name Terms." Look Japan. June 2001. Volume 47, No. 543. p. 35. ^ British Broadcasting Corporation Monitoring Service. Summary of World Broadcasts: Far East, Part 3. Monitoring Service of the British Broadcasting Corporation, 1984. p. SWB FE/7688/A3/9 6 Jul 84. "Meanwhile, the Chinese give Japanese names in Chinese pronunciation." ^ Ji, Heng. "Improving Information Extraction and Translation Using Component Interactions." ProQuest, 2007. ISBN 0549582479, 9780549582472. p. 53. "Chinese → Japanese It's difficult to identify Japanese names in Chinese texts because of their flexible name lengths. However, if they can be 'back-translated' into Japanese, the Japanese-specific information could be used for names – they[...]"
^ Denyer, Simon. "A turkey, or the Japanese prime minister? Chinese smirk as Obama pardons Abe." (Archive). Washington Post. November 26, 2015. Retrieved on December 17, 2015. ^ Huang, Zheping. "Nintendo is renaming Pikachu in one of its largest markets, and Hong Kongers are not happy — Quartz". qz.com. Retrieved 14 April 2018. Power, John. "Japanese names." (Archive) The Indexer. June 2008. Volume 26, Issue 2, p. C4-2-C4-8 (7 pages). ISSN 0019-4131. Accession number 502948569. Available on EBSCOHost. Some materials taken from Kodansha Encyclopedia of Japan, article on "names"
Hoffman, Michael. "What's in a (Japanese) name?" Japan Times. Sunday October 11, 2009. "Which names are to be found where?" Japan Times. Sunday October 11, 2009. Nichigai Associates, Inc. (日外アソシエーツ株式会社 Nichigai Asoshiētsu Kabushiki Kaisha) 1990. Nihon seimei yomifuri jiten (日本姓名よみふり辞典 "Dictionary of readings of Japanese names in Chinese characters"), vols. Sei-no bu (family names) and Mei-no bu (given names). Tokyo: Nichigai Associates. (in Japanese)「日本人の名前」目次 (Index page of "Names of Japanese") (Internet Archive) Japanese names in Kanji and Hiragana. Popular Japanese baby names 1994 to 2003. WWWJDIC online dictionary with over 400,000 Japanese names.